Are the 90% or 99% Flextops? 400 or 430 for my weight? SDM or RDM for 2016 Nexus? Eclipse on NoLimitz Original Skinny or Simmer RDM10 OK? What IMCS/ Bend Do you Recommend for Guru? Goya Nexus Compatible with NoLimitz or Powerex? Mix and Match New and Old Goya Masts? KA Sails Mast for Goya Sail? Rigging with Shorter than Recommended Mast? Powerex OK for Goya Sails? Goya RDM 400 Mast for Tushingham or North? Can Nexus & Freesurf be used with SDM masts? Is my non-Goya Mast right for my 2010 Guru? Ezzy Hookipa Skinny on 2011 Eclipse? Does the 2011 5.3 Eclipse work with a 430? Are these alternative masts OK for my Guru? For my 5.3 W3D, can I use a SDM or must the mast be RDM (I found an NP X9 on sale)? Will an NP RDM or Fiberspar RDM work with my W3D? How do I get the most out of my 2007 FXR? Are the goya 2012 masts changing in any way? Are today’s Goya masts compatible with the older sails? Which of the 90%-100% carbon masts would you recommend? What’s the ideal bend curve? How far can I go from that ideal bend curve ? Do the old Goya masts have a different flex than 2010 and after? Are the bend curves for masts unchanged from 2010? Is Goya 99% and 90% masts are flex top mast? 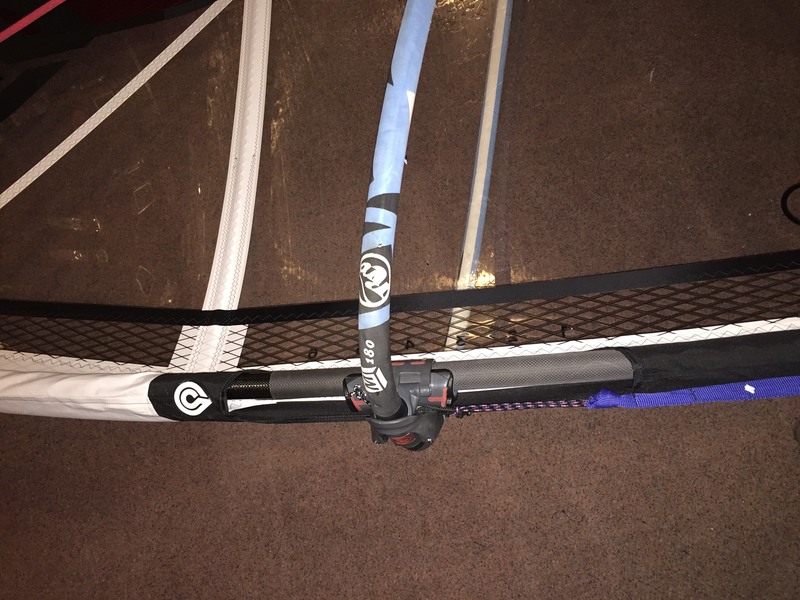 Is new Goya sail also works good with Chinook RDM 90 or 100% carbon mast? 64.5% / 79% is generally considered flex top. I see that Chinook masts are described as flex top. Putting constant curve in to Goya sails, 370, and 400 particularly, , , -the sail will loose some shape down low, and the leech will be a bit tighter. OK for lighter wind, but a bit of overall range will be lost. If there is no other choice, the sails will work OK on constant curve, but not as well overall. Goya 340 mast is a bit more constant curve, also 430, and Goya 460 and 490 I would describe as basically constant curve. says the 430 should be better for me – at 185 pounds – than the 400. I have the adjustable head extended out about as far as it can go (~13cm) and using the shortest setting on my extension (12cm). Downhauled so that looseness in the leech is to the dot (or a shade past). I could go another cm on the downhaul if needed but I’m trying to follow the specs. Do you think the mast is forward enough in the sleeve? Do you agree on Goya 430 99 RDM instead of 400? Just getting my questions out of the way up front so I can enjoy the sail the way you intended. Thanks. Mega apologies for the delayed reply,,, I’ve been super swamped getting ready to leave for China (Sunday morning) and trying to get and keep all my ducks in a row….!!! I believe Eddy did you right, and that you will be very stoked on the feel of that 430 99% mast. At 185 pounds, you have the weight to load the mast properly and get the flex feel out of it, and also get really good low end drive and stability. If you were 170 or under I would recommend 400 because the mast will flex a little more easily and give a lighter hand feel. The 5.4 Nexus on 430 for this weight rider will start to overpower a little more quickly than 400. At 185, you will enjoy the low end drive, great flex feel, range and also usability in larger sail sizes. Maybe a little more tension on the foot batten to clean the sail up a bit down there. Too much tension on that lowest batten will make it a little more difficult to rotate (a harder “pop”), so if you feel that, then you know you’ve gone too far. I see you are downhauled to the dot which is perfect, then just control the power with the outhaul. +2-2.5cm of positive tension (after the downhaul is set) is a good starting point. If the sail feels too powerful or pitchy, just add outhaul in 1cm increments until it fells right. Never over-outhaul the sail because you will kill the power and make it difficult to handle in any wind condition. The sail can be used with a bit less downhaul and outhaul in the lightest of winds to maximize the low end power. Hope this info helps Nathan, and do keep in touch and let me know how you go! Question: I bought a Nexus 5.9 2016. Which mast is better for it, SDM or RDM? Answer: Thanks for your inquiry and thank you for choosing Nexus! RDM offers easy rigging, softer feel, nice hand contact when sailing, and potentially super strength. We have a nice 70% SDM on offer for the first time this year- very nice blend of light and strong as our single SDM option at the moment. Our 90% RDM offers excellent feel, nice weight with excellent strength. Our 70% RDM is actually lighter than the 90% RDM and offers a great blend of weight, feel and strength. To find the best option, just have to describe your sailing (aspirations) and plug in the mast. -and just let us know if there is anything more we can do to help. Question: I have a Simmer x-flex (5.0) and Goya Eclipse (5.3) that rig on 400 cm mast. Any input on Simmer RDM10 vs. Goya Direct Drive for these sails? Am I missing something sailing them on my old NoLimitz “original” skinny? I’m 165’s. Answer: Thanks for your mail and question. Simmer mast should be OK.
Nolimitz original skinny 400 is stiffer in the top, softer in the bottom than the Goya mast. This will make your sails a bit tighter in the head, and softer (flatter) in the bottom. At your weight (165) the sail will feel ok, in light to normal wind, but will start to feel overpowered more quickly in strong wind compared to how it feels on a more flex top mast. Flex top promotes low stable draft and progressive leech twist- this allows you to rig the sail fuller in light wind (low stable draft for power, open head for control) and allows you to add a bit of outhaul as the wind increases giving easy control when powered up (open head helps here also). Stiff top/Soft bottom masts don’t have as much range as a flex top mast. I am not alone with my mast bend strategy- Naish, North Sails, Ezzy, Simmer (at least when I was designing them- now I’m not sure) among others all tend towards flex top. Question: I have just got a 2014 3.7, and 2015 4.2 and 4.7 Guru’s. Which IMCS and bend characteristics do you recommend for masts? Answer: Thanks for your email, and congratulations on your new Goya Guru sails! 4.7 calls for 400 mast, IMCS 19, base curve and tip curve also 64.5% and 79%. On the general market these masts would be considered “flex top”. If you use Goya masts, you could interchange a 370 top on to a 400 bottom achieving a 385 mast length, and then require a mast base extension of 28cm. This would allow you to cover the whole range with one and a half masts. If you are a heavier rider I would warn against it because the combo mast will be a touch softer and you will lose a bit of low end drive by extending a shorter mast and making it softer. If you are average or light weight, you might actually prefer the 4.7 this way because it is a bit lighter rig overall, and will have a slightly softer and more forgiving feel. Please let me know of you have any more questions. Question: Does the Goya Nexus rig satisfactorily on No Limitz Skinnys or Powerex RDMs in the appropriate length? Are your masts considered constant curve or flex-top? Answer: Goya masts are considered flex top in lengths 370, 400, 430, and more of a constant curve bend in the lengths 310, 340, 460 and 490. Nolimitz masts tend towards constant curve in every length listed here. So, to answer your question- Nexus requiring 460 or 490 will rig OK on NL, 430 is not as good but basically OK. Nexus 4.3 and 4.9 really do much better on a Goya mast. Answer: Nice to see you taking advantage of the mix and match lengths- I spent June in Europe doing promotion and this was one of my top topics of discussion with people… When they get it, they are stoked. Any black or grey mast with “Made in the USA” on the label is interchangeable between lengths. Question: I have a Ka sails rdm mast and I want to know if it is able to be used in goya guru 2013.Also an epic super skinny mast would be ok? Answer: They will work, the question is how well. If I could bend the masts, I could tell you more precisely. The thing is, I don’t know how those masts are supposed to bend, and it’s often difficult to get that info out of the manufacturers. Generally speaking, the Goya masts tend to be a more flex top type bend, particularly in the lengths 370, 400, 430.The bend spec is bottom- 64.5%, top- 79% for those lengths. This bend curve helps keep the draft locked low and forward, and keeps the leech twisting smoothly and progressively through the top. I hope this info helps. Question: What can happen if you rig a 5.0 with a 3.70 m mast or a 4.2 with a 4.0m mast? Answer: Rigging a sail with a shorter mast (plus longer extension) will result in a softer rig overall, and rigging a sail with a longer mast will result in a stiffer rig overall. This can work to your advantage if you want to enhance a certain handling characteristic in the sail- for example lighter sailors tend to like softer rigs and heavier sailors tend to like stiffer, more direct rigs. Also- with the Goya mast program you can mix and match different mast length sections to achieve a certain feel (always the short section on top), and to reduce the number of masts you need to cover a sail range. For example- 4.2, 4.7, 5.3 can be covered with 4 mast parts- 400 complete, 430 bottom, 370 top. QUESTION: I use Powerex masts either 85 or 100% carbon depending on the length. Are these suitable for use with your sails? I’m very familiar with the older US produced masts, but when they moved the production to China, and then also when the company sold and production moved again, I lost touch with the finer details, quality and consistency of the mast… I can’t comment on those masts with any certainty. Please keep Goya Masts in mind of you every are thinking of updating your masts. All goya masts are produced in the US (5 minutes from where I spent the summer in the gorge actually) and they are bar none the strongest, most consistent bend, best feeling masts I have ever used. My previous favorite was the old US produced powerex masts. I don’t mean to sound like a salesman here, but I am super fired up on these masts. QUESTION: Got a mail from one of our customers who wondered if a Goya RDM 400cm mast would work on sails from Thusingham or North. ANSWER: I believe that the Goya mast with it’s progressive bend curve is very adaptable to pretty much any sail on the market, and even better, because it emphasizes low locked power and a smooth progressive twist through the head of the sail. Also, time has proven the Goya mast to be incredibly strong. Question: Nexus and Freesurf Eco can be used with SDM masts? (approx. 5,3 + 6,3 sizes). What is approx. weight of these models and do you have them on stock? Answer: Freesurf and Nexus are SDM compatible in lengths 430, 460 and 490 only. Question: I have a 2010 Goya Guru 4,7 since some weeks. I bought this sail, because you recommanded it for highwind windsurfing for lighter guys. I´m 73 Kg an so i thought it would be a good choice for me. Now I tested it in higher winds at the canaries an I was a bit unsatisfied. Compared with my North Ice 4,7 from 2009 it was less pressure stabil in a medium trimset (not trimmed it full power, because it was only 6 Beaoufort). Because it´s a reason of a wrong mastchoice!?? I used an 100% Carbon North Sails Skinny Mast in 400. What Masts are you recommanding. Please give me some advices more than only the Goya mast itself, because I would buy a second hand one! Thanks for your help. a good setting for pretty much any condition. Then you use the outhaul to control the power. increase it to reduce power and create a more neutral feeling sail. 79% top, imcs about 18.5.
last weekend I could test the 4,7 Guru in reallly strong winds and great waves in Netherland. Your setting tipps were great. Now I love the sail. I put the downhaul like you said and I could control the sail even in heavy gusts between 7 to 8 Beoufort. Some other guys were already on 3,7! The handling was perfect and stays like in 5/6 Beaufort. With my 73 kg bodyweight now I have a perfect sail from beginning of 5 up to high 7 beaufort, a sail with a really wide windrange and a great handling, thats perfect! Great sails, good job boys!!! Thanks a lot for your help. I will recommand your sails to everybody I will meat! Know I have to test your boards too maybe…. Answer: Stoked to hear you got the new gear. The 5.3 Eclipse requires a 400 mast. Your Ezzy 400/19 should be OK! The difference with the new Goya masts is that we have modified the lay-up of the masts to increase the durability, and the layup change also improved the feel of the masts. Please feel free to contact me any time with feedback or questions John! Question: Does the 2011 5.3 Eclipse run on the 430 mast as well or does it require a 400 mast? Also wondering how the 2011 Eclispe works on the no limitz (91% carbom rdm wave mast (particularly interested in the low wind aspect)? Answer: 5.3 Eclipse requires 400 mast, or 400/430 combo- preferably 400 bottom, 430 top. I don’t recommend any of the stock Nolimitz masts for our sails, except for 340 in very rare cases. The quality of the Nolimitz mast is unquestionable, it’s just the stiff tip that kills the compatibility with our sails. Question: I will try again. It seem impossible to get a goya mast at a reasonable price in Denmark. I am thinking of amex, maverix or thusingham instead. What would you recommend for the Guru 4.5 and 5.0? Will a 4.0 Guru rig on a 400 mast? Answer: 400 mast for 4.5 and 5.0. 400 mast on 4.0 will extend 20cm above the sail. This will make the sail feel a bit stiffer and more direct compared to having a 370 mast. For a heavier rider, it can be more OK. A lighter rider will suffer faster for that compromise. The key to getting a good 400 is that you find a mast with a flex top bending characteristic- you want the tip to bend about 79-80% of the max bend amount. Goya masts bend like this. North, Pryde, Simmer, Naish tend to bend like this. The companies you listed tend to have stiffer tips, and you compromise the range of the sail. Try to get the bend info from the masts you are considering, and then decide from there. The sail may work on SDM, but it would have to be rigged with the mast to be sure. The thing to look for if you do check it on SDM is the foot batten (lowest batten) roatation around the mast. If the batten doesn’t clear the mast easily when you rotate the sail from tack to tack then it’s not compatible. Please note- you are taking a risk on that NP mast- I wouldn’t advise committing to it- if the rotation doesn’t work than you will be stuck with non functioning mast. The only way I recommend SDM for the W3D sails is if the mast can be checked in the sail- every company’s (SDM) masts bend differently, so compatibility has to be considered on a case by case basis. Question: I bought a Goya W3D 5.3 2008 and was wondering if the Neil Pryde RDM or Fiberspar Tidal wave RDM would match your sail curves (or does the gaastra type mast would fit better). 400 length19 imcs65%/79%- tip/base curve percentage.Carbon content 85% or higher. I think the fiberspar would be OK, as well as the pryde, the Gaastra, I’m not so sure about. I hope this info helps. I also hope you enjoy your 5.3 W3D! Question: I recently acquired a (previously unused) 2007 FXR 7.5m sail. I have a feeling that I’m not perhaps getting the best out of it, possibly down to using an old mast (over 10 years old – having only recently got back into windsurfing). I was wondering what sort of mast you would recommend, for freeride conditions – often on quite bumpy water as I live in Guernsey – a small island in th English Channel. My board is a Bic 270 Vivace 96 litre, again over 10 years old but in good condition. The most important thing is to get enough downhaul on the sail.You should downhaul the sail until the leech goes nice and loose in the head. Control the power with the outhaul. After downhauling, neutral outhaul will give you max power. 4cm of positive outhaul will make the sail less full and easier to handle in higher wind.Make sure your battens are tight- lots of tension on the lower battens because they are long and deep, and just a little on the top battens because they are short and flat. It’s hard to give you much more specific information because I don’t know exactly what sail you have (your sail is from before my time designing Goya Sails), and I don’t know exactly what mast you have. Just because your mast is old doesn’t mean it’s obsolete. The Goya masts are staying the same for 2012- the only difference is that we are switching to black color. We worked really hard on the mast development in the last 2 years- many many prototypes and much much testing and I feel confident that we have the strongest, and best feeling masts on the market right now. Yes, today Goya masts are compatible with older Goya sails. Our masts have a unique bias lay up that makes them almost unbreakable as they can bend and twist at the same time while still maintaining stiffer bottom section and fast flex top, that difference is what allows the power on the sail to remain lower and forward and the right top is what makes the sail faster and feel lighter, easier to fly. Answer: For us the ideal bend curve for a windsurfing mast that also seems to work in most sails is for a 400 64.5/79 with 18imcs, but also have to keep in consideration the carbon content, if you increase the carbon depending on the layup the imcs might need come down. Rig the sail with the recommend mast and with the optional you are considering, pump it on both masts, even with no wind inside a shop you will be able to see right there if the draft moves up/back, if the outhaul range gets reduced and the looseness of the leech gets lower while the top doesn’t. Also keep in mind that although most masts in the market say similar %s as ours but their consistency may vary considerably, so please rig the mast you are considering as this will have the biggest effect on your early planning, range and control. 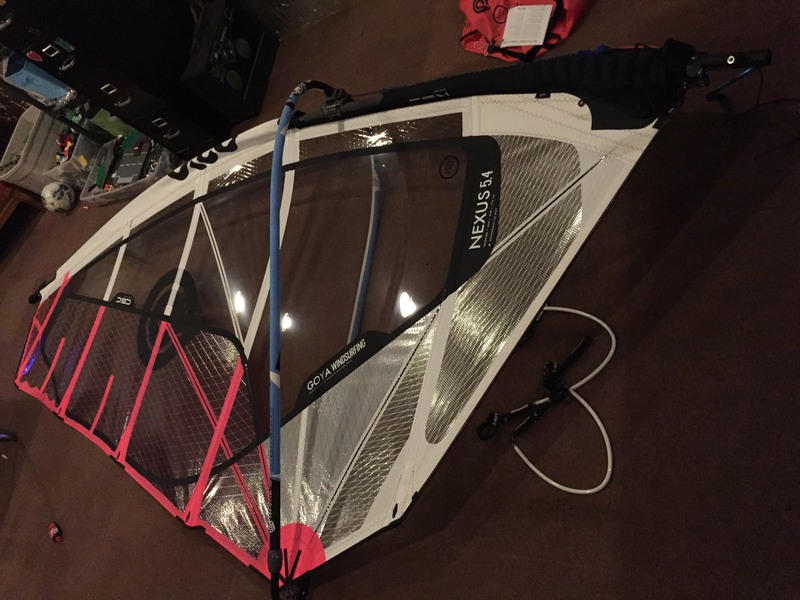 Question: Last year I bought a 370, C75%, IMCS 17, used it with a Naish 4.0 Session sail. The Combination was superb. This year I tried to use a 2010 370 Goya Mast (same IMCS,same Carbon%) and the result was rather disappointed. So I believe the New Goya Masts have a completely different Flex, they must be much More SoftTop than in the past. My question is about the old Goya Mast and especially the one I still own: What is the % flex of the Bottom, Top of this mast? It must be very close to the Naish Masts which have (64.5% Bottom, 74.5% Top). Answer: Your guess about the bend of the older Goya mast is correct. The older Goya masts (pre-2009 production) have a stiffer tip compared to the newer masts. The newer 370’s and 400 Goya RDM’s (the USA produced masts) have a base/tip curve of 65%/79%. This is a better fit for the modern Goya sails (2009 and onwards). The bend curve is around 65%/76-77%. Question: We are just waiting for the 2011 shipment next week so we are really exited to test new sails in the already cold waters of the Adriatic Sea. Are the bend curves for masts unchanged from 2010? Answer: Mast bend curves are unchanged for 2010.